Peterson at last year’s Fortune Most Powerful Women Summit in Washington, D.C.
It’s extremely important to us at Johnson & Johnson to nurture the careers of the women who work here. Not only is it simply the right thing to do, but we’ve actually found that it’s been an important business advantage in bringing the very best to our patients and consumers. To accelerate the development of women’s careers at the company, we look to partner with like-minded organizations whose values align with ours—and that can expand the resources available to our employees. We’ve partnered with Fortune in several capacities over the years in support of the robust leadership community they’ve created amongst the world’s most powerful women. 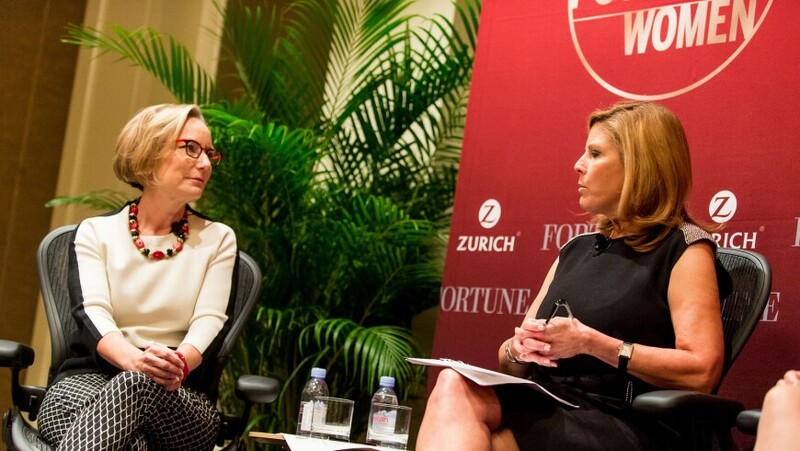 In 2014, we were a partner of the Fortune Most Powerful Women: Next Gen Summit. In 2015, we joined forces to bring principles of health and wellness to the most powerful women community through sponsorship of the Fortune MPW Summit in Washington, D.C.
And this year, we are thrilled to take our partnership to the next level as the first-ever Fortune MPW Global Partner, with Fortune MPW U.S., Europe, Asia and Next Gen. In fact, a number of our very own most powerful women at Johnson & Johnson are gearing up for next week’s Fortune MPW International Summit in London. What started as one conference 17 years ago has quickly become recognized as a cornerstone among prominent global women leaders in business, government, media, philanthropy and the arts—and that’s a movement that we are on board with. The value that we place on diversity in the workplace at Johnson & Johnson—and providing enriching environments in which women can harness their fullest potential—is matched by Fortune and their determined leadership. As a global company comprised of powerful women leaders around the world, our global partnership with Fortune provides continuity for Johnson & Johnson to play an active leadership role in the entire MPW community. Our women leaders all over the globe will have opportunities to participate in the community beyond the annual MPW U.S. Summit. We will now have representation at the international level at the MPW Summits in Asia and Europe, the MPW Next Gen Summit and we’ll continue to participate as a host company for the Fortune/U.S. State Department Global Women’s Mentoring Program. I’ve personally made invaluable connections and built lasting relationships with women I’ve met through the MPW community—leaders who’ve inspired me in many ways. I’m excited about the unique opportunities this partnership allows us to spark those same types of connections for other women, to learn from one another and to make lasting impressions on those we cross paths with along the way. Sandi Peterson is Group Worldwide Chairman for Johnson & Johnson. Her portfolio includes the company’s global operating infrastructure, multiple consumer-facing businesses and key enterprise initiatives designed to spur innovation and accelerate growth. She is at the forefront of Johnson & Johnson’s efforts to transform healthcare using technology and design-thinking to leverage its unique assets in innovative ways to create breakthrough solutions. Sandi has been named to Fortune magazine’s list of The Most Powerful Women three times, most recently being the 2015 list.